With regard to the emergence of new concepts in dental treatment involving placement of dental implants and the significance of therapeutic treatment of the intrusion in their complications. The purpose of the article is to make a review of the problems and to point out options for their treatment. Key words: periimplantitis, dental implants, complications, failures. 3. 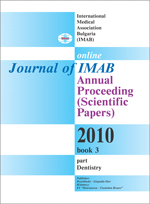 Brägger U, Karoussis I, Persson R, Pjetursson B, Salvi G, Lang N. Technical and biological complications/failures with single crowns and fixed partial dentures on implants: a 10-year prospective cohort study. Clin Oral Implants Res. 2005 Jun; 16(3):326-34. 4. Schug T, Dumbach J, Rodemer H. [Mandibular fracture. An unusual implantation complication] Mund Kiefer Gesichtschir. 1999 Nov; 3(6):335-7. German.